Quel beau ciel, très photogénique. Picturit: Thank you, Martine. It is always a pleasure to be in the harbour. 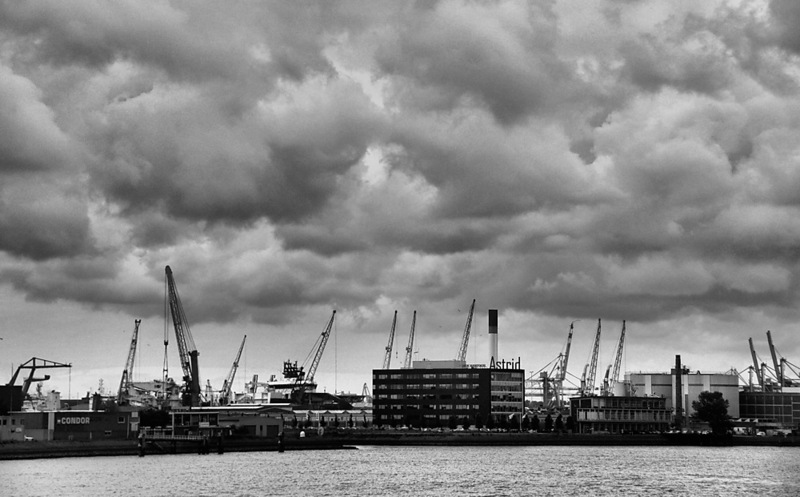 Oh - love those heavy clouds, and all the cranes reaching up to them! Picturit: Thank you, Elizabeth. We so loved the boat-tour through the harbour, more to come. It was that kind of wonderful day, Astrid. The sky was a fabulous backdrop against all those cranes. I love it. Picturit: Harbours and all what comes with it never bores us, Claudine. And many photo-ops of course. Picturit: Great play on words here, Lisl. LOVE it. A perfect day in the harbour. Oh I remember the Astrid building in Rotterdam, perfect for Black Monday. Picturit: Thank you, Chad. Yep, I took over the building... The sky became more blue while we were there. More pictures to come. Picturit: We started out with a lot of clouds and later the sky became blue, Alan. I "took over" the building. I bought a polarizing filter in the USA and I am still experimenting with it, thanks to you!! Have a great trip in France. Very moody and scenic. Ginnie must have been in crane heaven! Picturit: Thank you, Larry. It was Ginnie's birthday that day and yes she loved seeing the many many cranes. Mooi zo in zwart-wit uitgevoerd. Picturit: Dank je wel, Marjolein. Dat was een mooie tocht met de "Spido" en ja ik heb dat gebouw maar "overgenomen"... . So black, and a low sky! Picturit: Don't you just love it? Knap gedaan. I like the relations of water : buildings : sky. All the cranes reaching up, are like eager chicks in a nest. Picturit: Dank je wel, Louis. You have a wonderful way of putting it into words!! I juts read it to Ginnie. Love it. Not only a fine industrial landscape but a very good sky to go with it. Picturit: Thank you, Brian, more picture to come. It was a wonderful tour. Picturit: She loves cranes, in that regard she was on the front row HA. quite a scene that you captured here, Astrid. and in b/w it gives a strong impression of the early days of industrial revolution. Picturit: Going towards the harbour is so nice. We took the short tour of 75 minutes, totally worth it. And yes B&W adds more drama to it. You are not kidding, Astrid! Picturit: Don't you just love it. That looks great in black and white. Picturit: Sometimes I love to do B&W and change the mood of the picture. What a sky! B/W very effective here. Picturit: Thank you, Bonnie. We started out with a cloudy morning and during the trip the sky became blue and almost no clouds. Now that's a lot of cranes! Love your name placement!